Muskerry News | Great day as UTI Blarney Taekwondo Club bring home 32 medals! Great day as UTI Blarney Taekwondo Club bring home 32 medals! 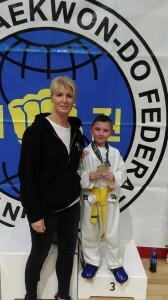 Local club UTI Blarney Taekwondo took part in the Scion Open Taekwondo tournament held recently in Neptune stadium. It was a very successful day out for the club which operates under the tutelage of senior instructor Mr Nial O Keefe (6dan). 19 students, ranging in age from 5 to 19, took part and collectively came away with an incredible 32 medals. Blarney taekwondo is a very family orientated club with many children training alongside their parents, uncles, aunts, brothers and sisters. Blarney taekwondo was founded more than 20 years ago and continues to go from strength to strength with training on Monday and Wednesday evenings in Scoil Mhuire Gan Smal, Blarney, juniors aged 5 – 14 training from 7.15pm – 8-15pm, and seniors training from 8.15pm – 9.30pm. Blarney TKD club can be contacted on 086 6058441, or you can find them on FB @ Nial O’Keefe (Blarney taekwondo). New members are always welcome.